The recipe here is for a straight-up classic, Genovese basil pesto that I make quite often. It freezes well and it’s versatile in its application: use it in soups, to season roasted vegetables, spread it on sandwiches, fish, meat, and, of course, add it to pasta. 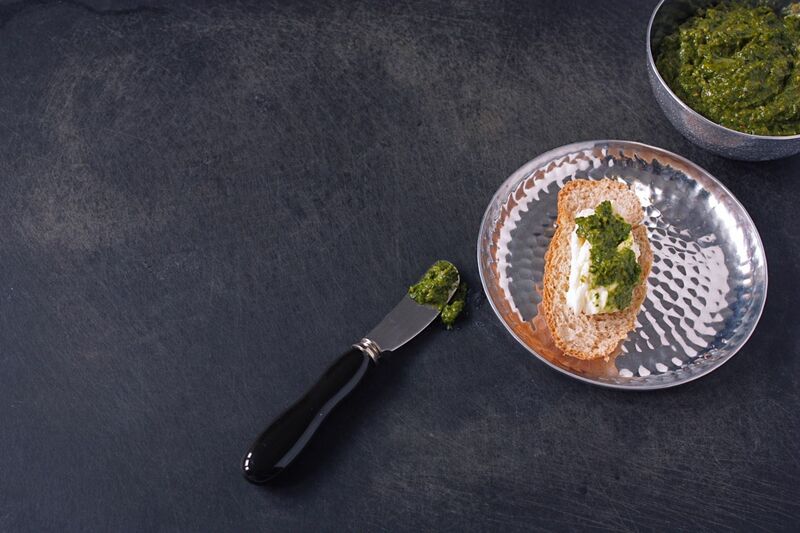 But the best part about pesto is that once you feel comfortable making it, you start to make it to your own taste and adapt it to your needs. You can actually make pesto vegan, for example, omitting the cheese entirely. I’ve substituted goat cheese for the Parmesan which some people with a lactose intolerance have told me they’re ok with. I’ve made it without nuts for people with allergies to them. The texture changes in both cases but herbs, garlic and oil makes for a tasty sauce so no one seems to care. And if you have kids, I probably don’t have to tell you that kids love “green pasta”. I decided once to make this pesto with a lot of kale in addition to the basil, and tossed it with animal-shaped pasta for a picnic at the zoo with all of my cousins’ little children. They squealed. Over kale.